LC-50 $179 In Stock Available to Ship! Rate and Offset adjustments for each channel allows exact matching of dimming behavior of each channel. Multiple channels can then be joined and controlled by a single knob. Q: Why can't I just use a simple rheostat or potentiometer to dim the panel lights? A: Potentiometers can't handle the current of more than two or three typical panel post lights. The LC-40e and LC-50 will dim up to eighteen post lights per channel. Q: Why do I need more than one dimming channel? A: General aviation airplanes have notoriously poor cockpit lighting. In part, this is due to trying to dim all the lights with one control. Invariably some lights need to be brighter than others. For example, post lights generally need to be operated dimmer than internally lit instrument lights. Did you know that airliners have more than twenty dimming control knobs in their cockpits to attain proper brightness for each group of lights? Q: What is the difference between the LC-40e and LC-50? 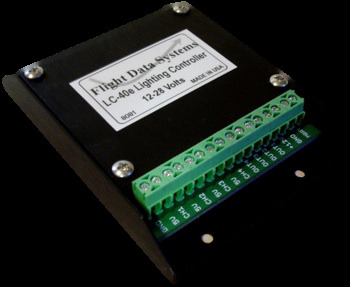 A: 1) Certain devices do not accept PWM (Pulse Width Modulation) dimming and require an analog signal which is only available on the LC-50. See the list of devices located below the LC-50 image. 2) The "Master Bright" feature of LC-40e allows matching the offset of each dimming channel while the LC-50 has both rate and offset adjustments for each of its four channels. As a result, the LC-50 has more exact matching of each lighting channel's behavior which is useful for a single cockpit knob installation.